Wow, I haven't posted about Minecraft since March. I think part of that is that my first builds, from 3 to 4 years ago, are nowhere near as pretty as the ones I'm building nowadays. 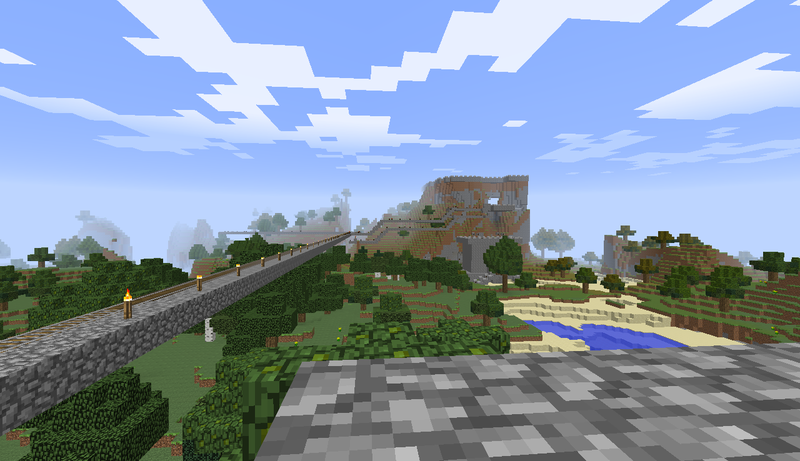 I've finally decided that I'm going to share them anyway, because it'll be fun to have my entire Minecraft journey documented. First, a quick announcement: I'm taking this next Thursday and Monday off from posting, to celebrate my birthday weekend. :) So there will be a brief break before my next post. 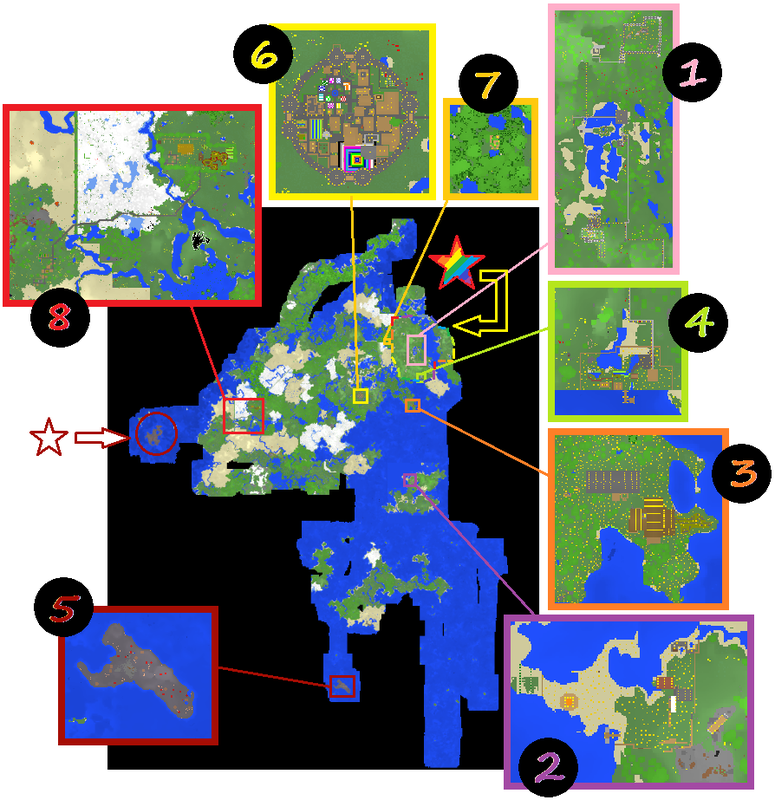 To start, let's go back to the overview picture of my gigantic Minecraft world that I've been playing in since August of 2010. Today I'm going to show you the area in the box #1 - the early days. 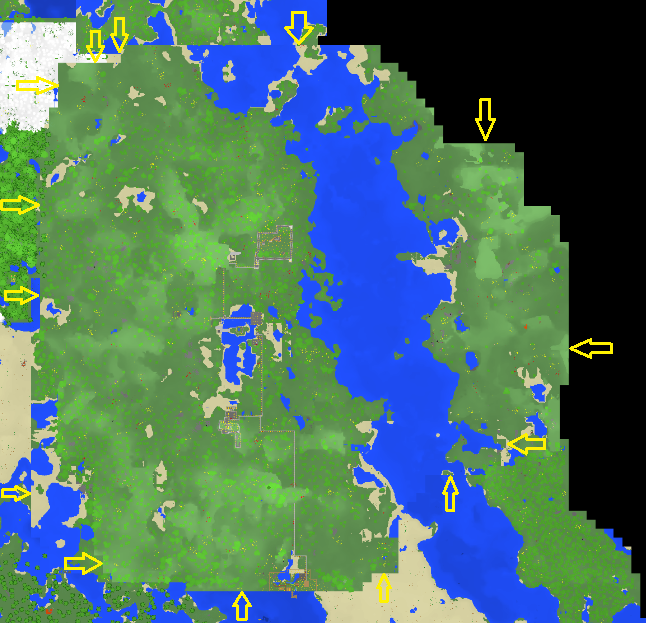 Zooming in, I've marked the outlines of the beginning of my world with yellow arrows. 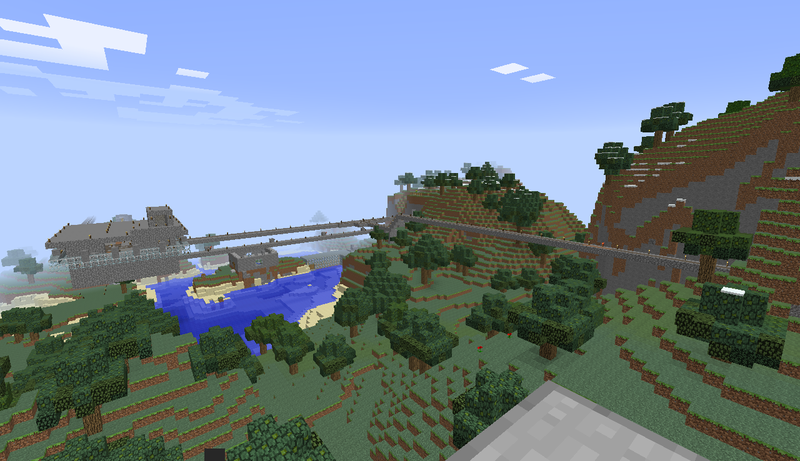 This is the area before the first major biomes update, that brought more than one biome into a world. Before then, each world was entirely made up of a single biome (essentially a winter or summer biome). 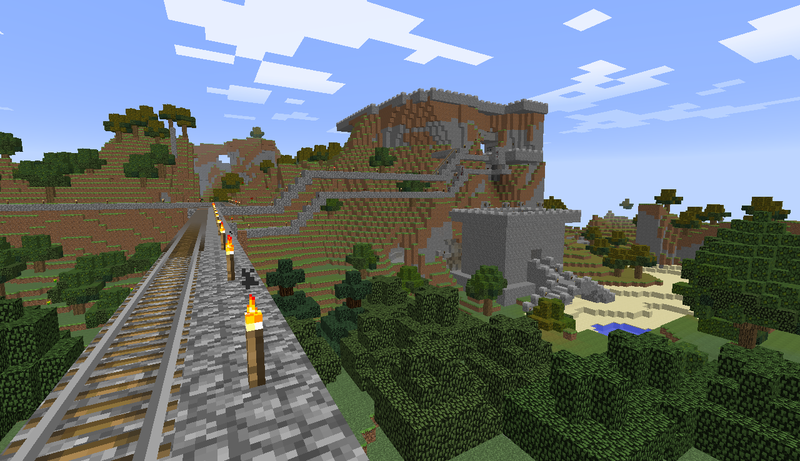 When Minecraft does major biome generation updates, it creates sharp delineations on the edges of old worlds, which you can see below. 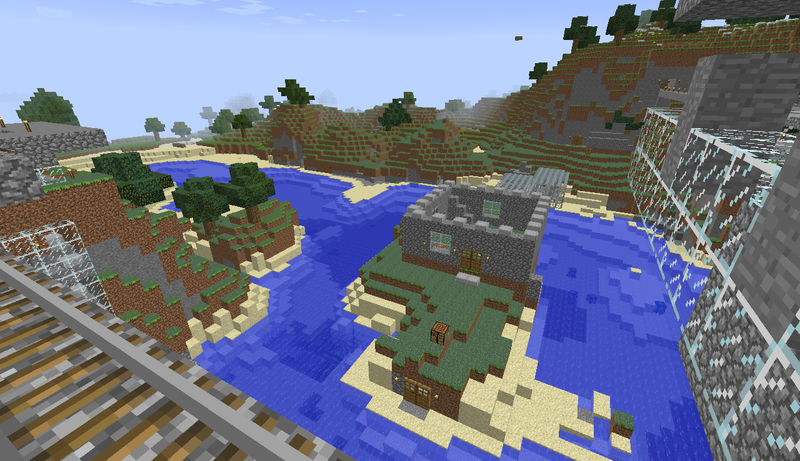 Zooming in further, you can see the birds-eye view of my first builds. 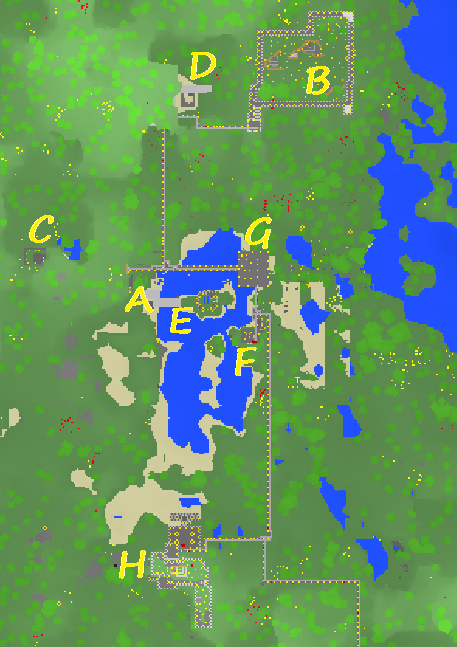 The long grey lines are mostly minecart tracks between areas. 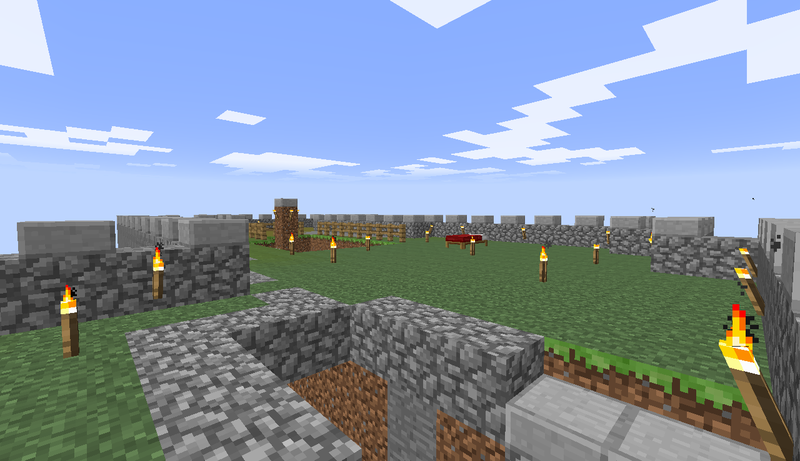 Starting at the letter A above, here is my spawn point, complete with my first crafting table! 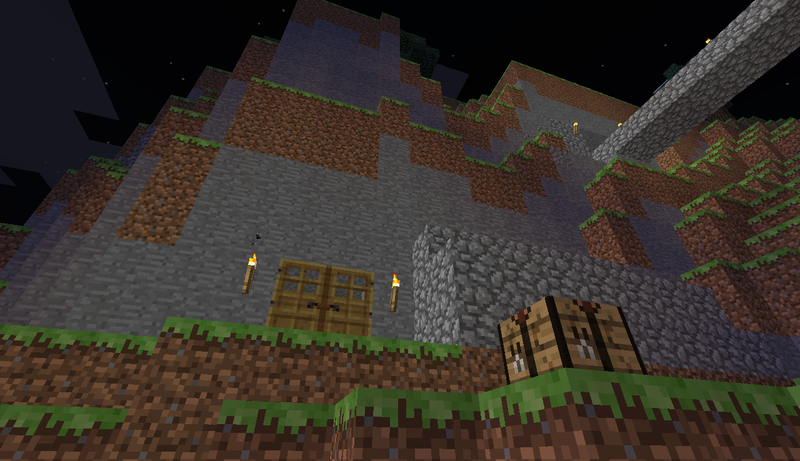 The first thing I did was start to dig into the mountain to make a home. Turning around, you can see Inverness, the aerial train station (letter G), the island fortress (E), and Lorwick Tower (F), from left to right. 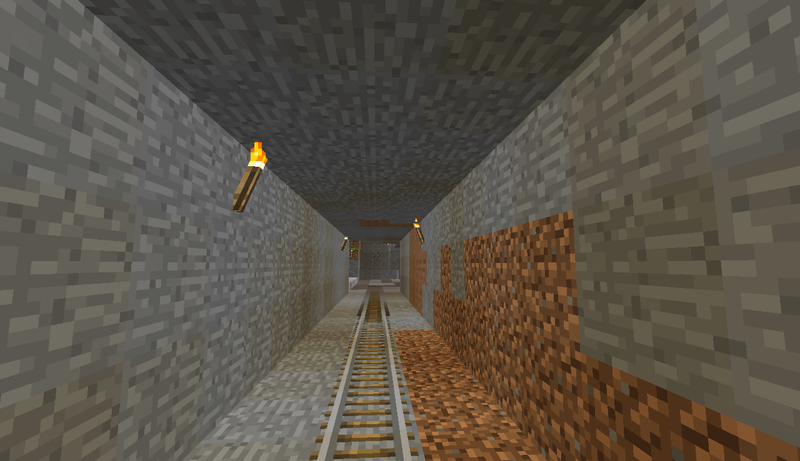 I tried to keep minecart rails away from hostile mobs by having them either enclosed in glass or on lit rails in the air. 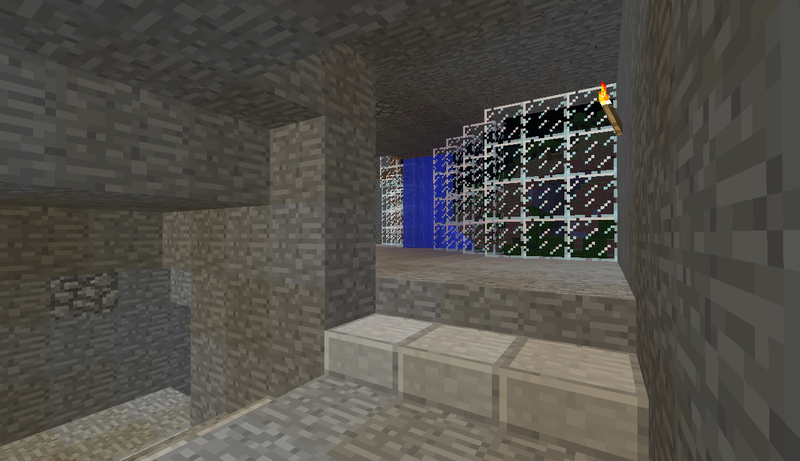 Turning back around and going through the double doors, you see the open area I first carved out. 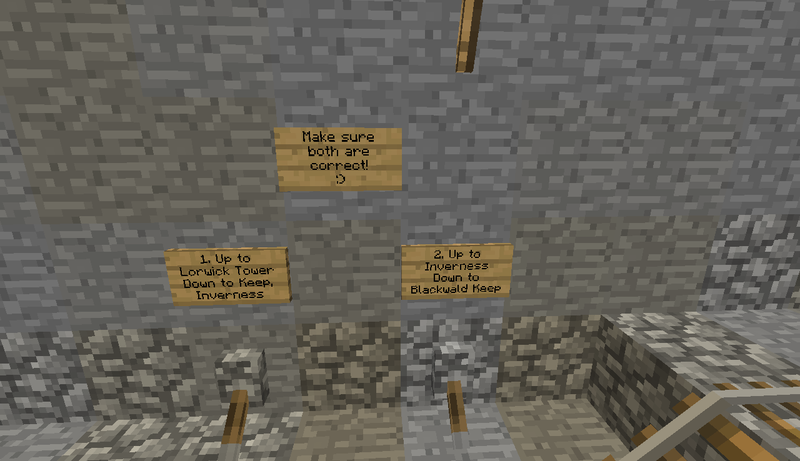 These signs tell you how to flip the switches to make the minecart system go to the correct place. Not all of the rails have been completely updated to powered rails, even though that changed years ago, as I spend most of my time in other places nowadays. 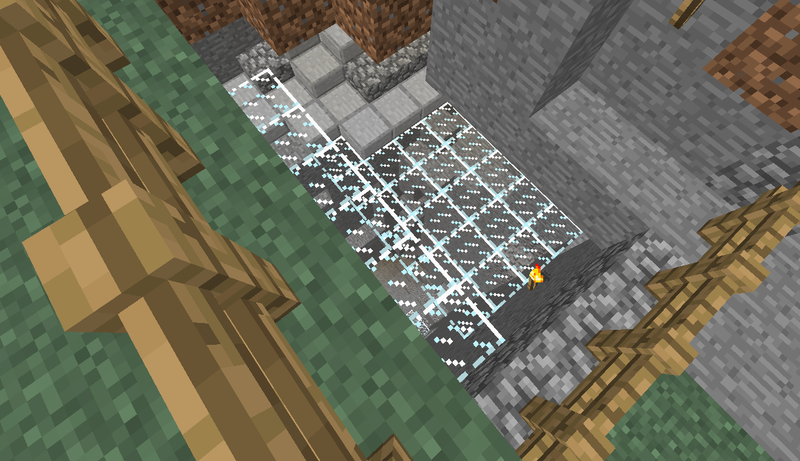 If you follow the myriad of hallways and stairways that I dug out of the mountain, you get to the area marked C on the map above. 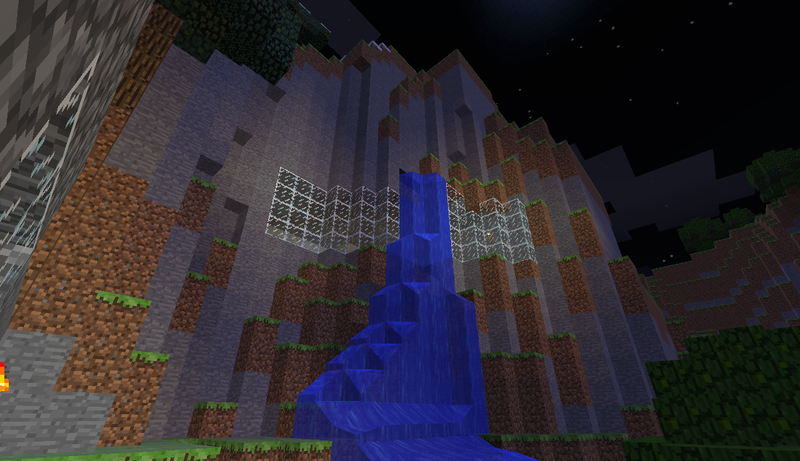 I built a stairway up to the top of the mountain that goes near a natural waterfall. 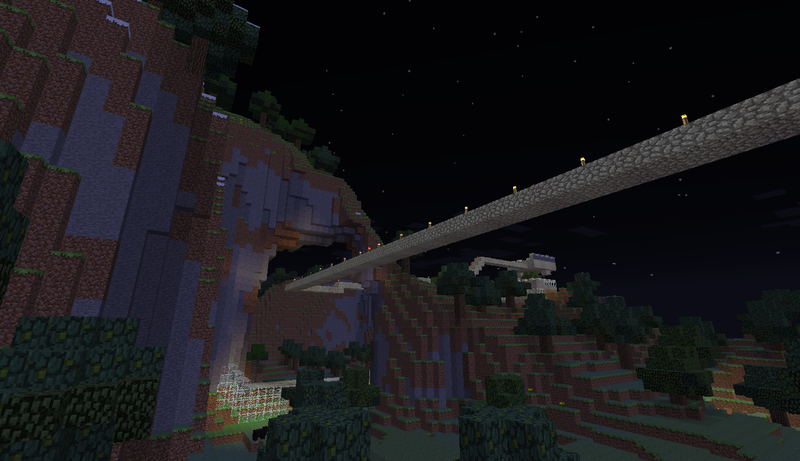 A picture of a natural archway found near my spawn point, between Inverness and Blackwald Keep (B). 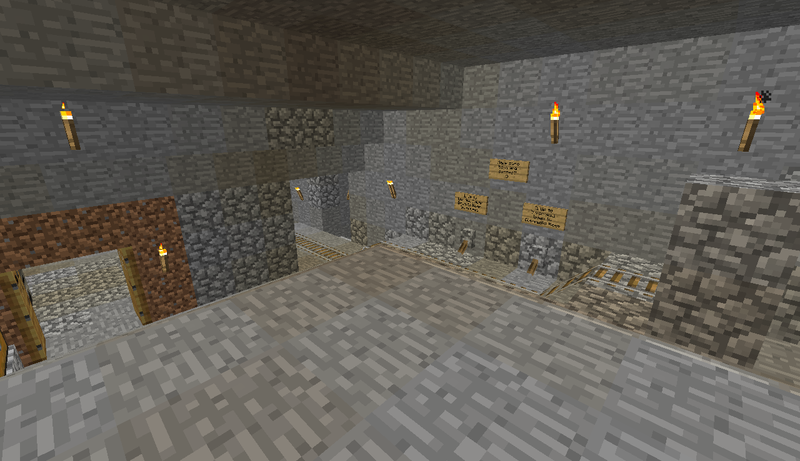 You can also reach Blackwald Keep by going through this tunnel inside the mountain. 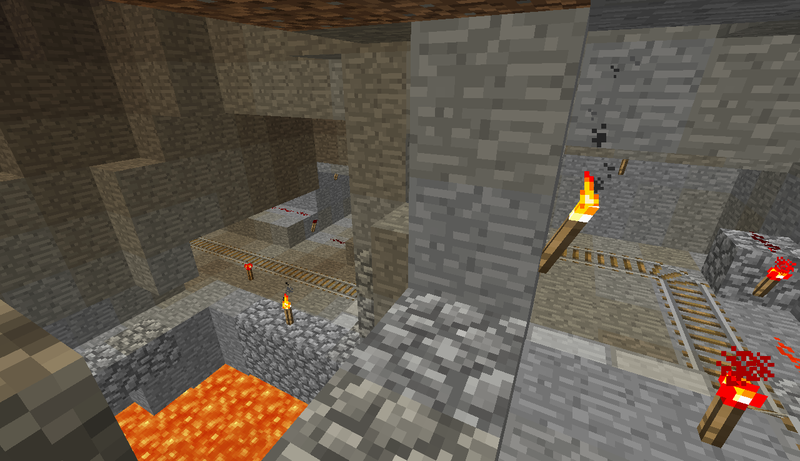 The reason I built Blackwald Keep there was to surround the giant hole going deep into the ground - the site of my first mine! I eventually covered the top of that hole with glass, after several times falling to my death whilst walking around the Keep. View from inside the Keep, in the corner. 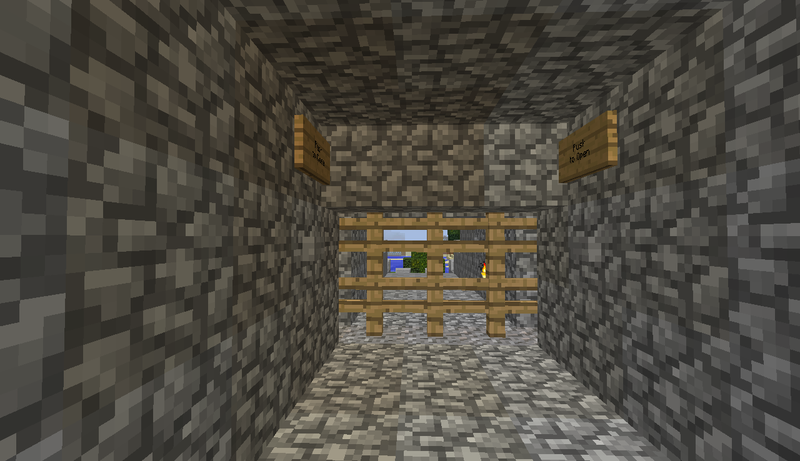 You can glimpse the chests down inside the fenced-in area (the same chests photographed above, near the mineshaft). 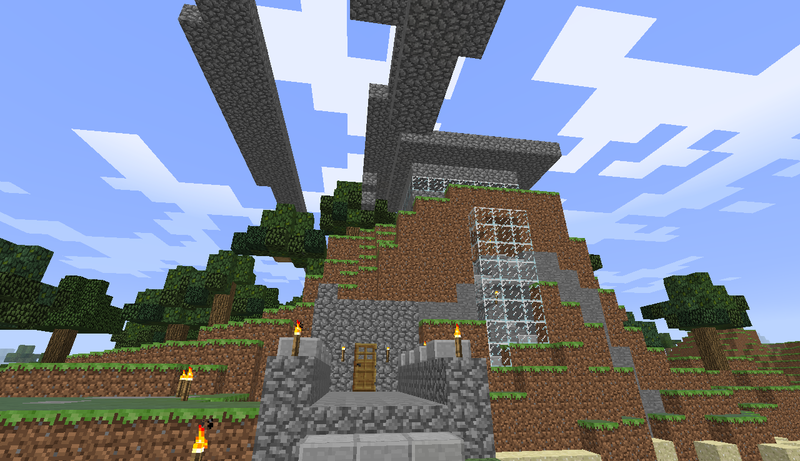 Top of Blackwald Keep. You can walk all the way around the top of the wall. View of Inverness from the top corner of Blackwald Keep. Inverness is the train station in the sky. 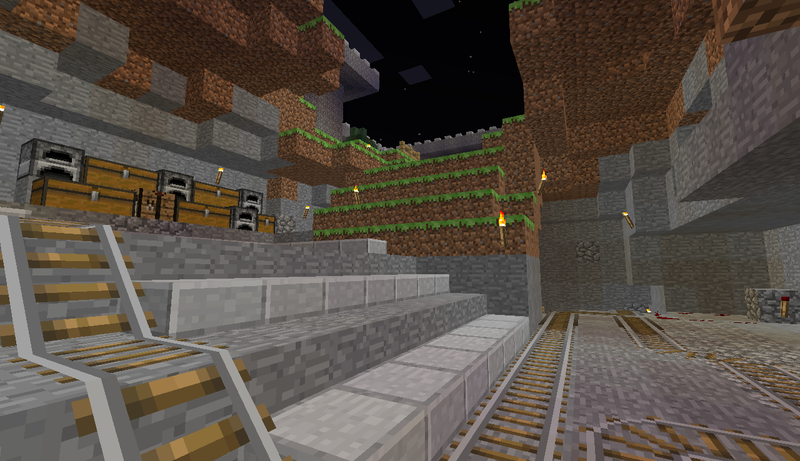 Most of the local minecart rails end up in Inverness, where I flip switches to go back out to the other destinations. 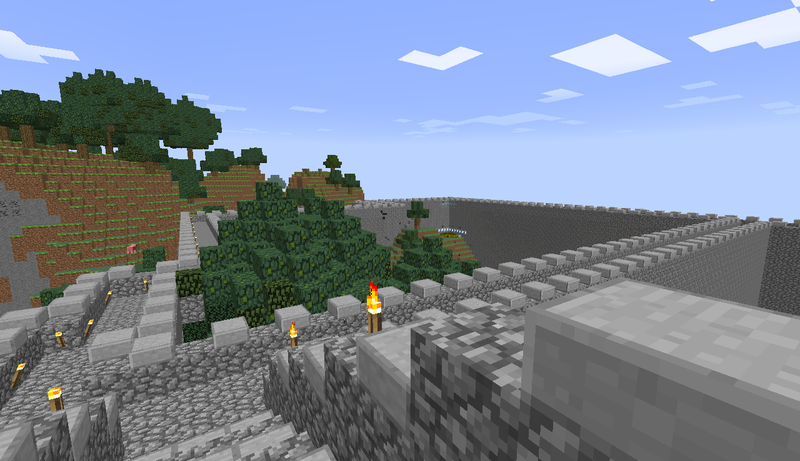 Here is another view of the little island fortress. 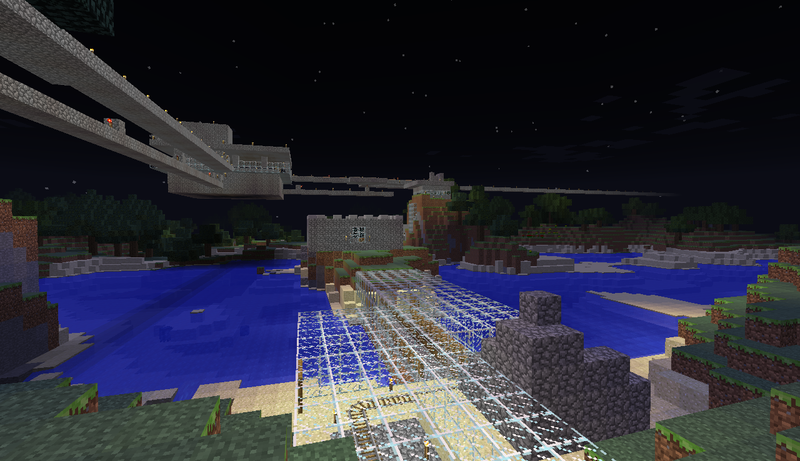 There is an underwater minecart system going from the first mountain home (across the water), to the island fortress, to Lorwick Tower (to the left in this photo). View from the top of Lorwick Tower, looking out to Greywynd (H). Approaching Greywynd, you can see it's another house built into a mountain. 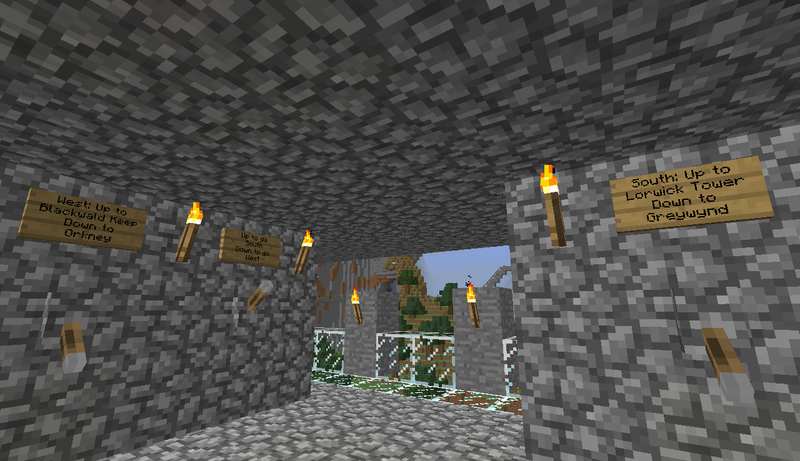 There is a portcullis built into the tower in front (leading to the beach), powered by redstone circuitry. 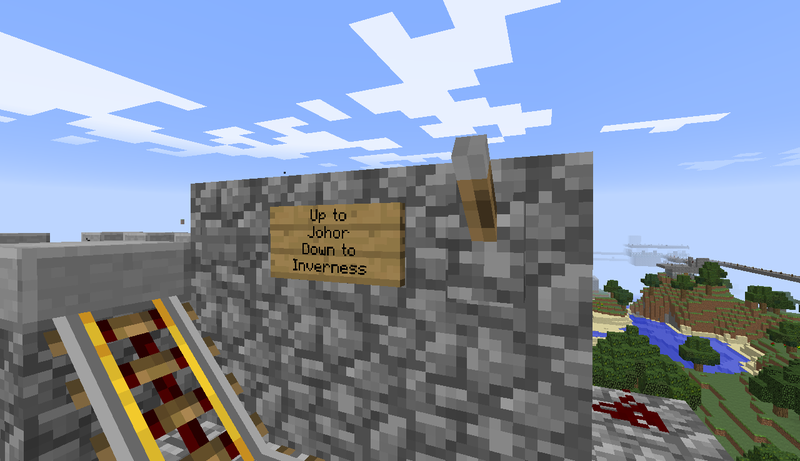 When you reach Greywynd, you have the choice of taking the minecart back to Inverness, or going on to Johor, the lakeside town off the bottom of the map (not talked about in this post, in box #4). 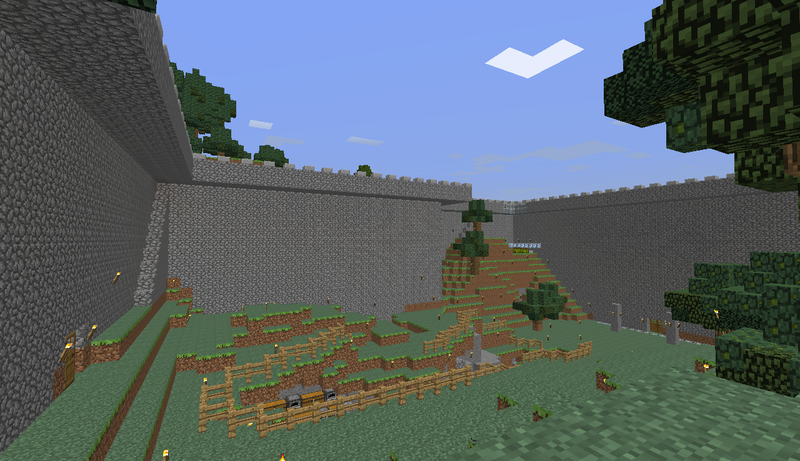 Here's the portcullis blocking the way between Greywynd and the surrounding countryside. 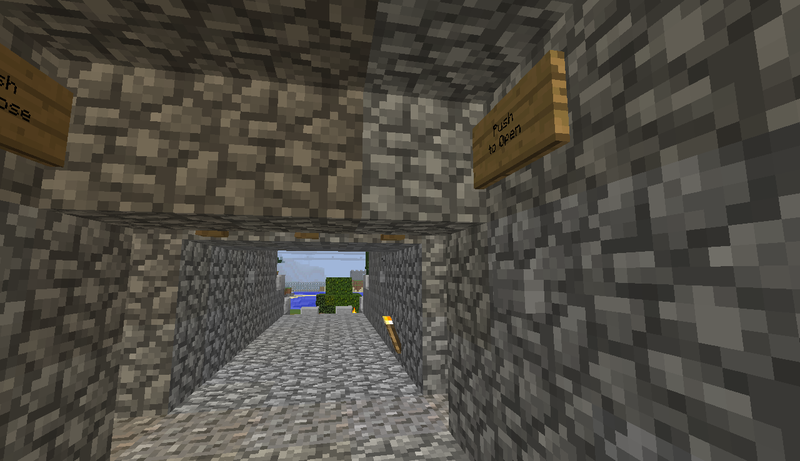 The two signs tell you which button to press to raise the portcullis, and which to press to lower it again. 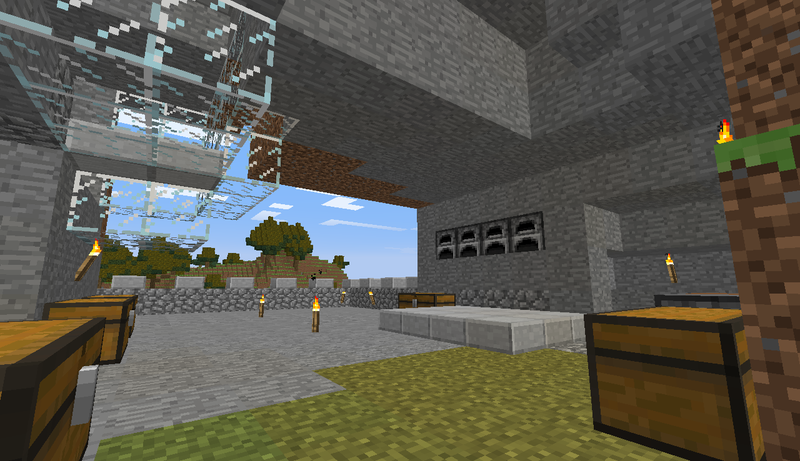 Below you can see the raised portcullis.